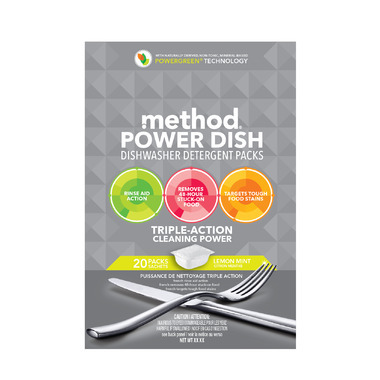 The Method Power Dish Lemon Mint is made from an naturally derived, non-toxic, mineral based formula. This biodegradable formula has no phosphates or bleach and will be able to remove tough grease & 48 hour baked-on food! The smell is amazing, and it cleans really well. I only use this brand for my dishwasher! I bought these for my mom. She loves them. The dishes come out very clean. I will be buying more soon! These dishwasher tabs are fabulous! They not only smell great, but they do a great job on the dishes. I definitely recommend these to anyone looking for a GREAT dishwasher product! Love all the Method products. And this one is no exception. Gets the job done. Love that this is a naturally derived product and will not harm me or the environment.